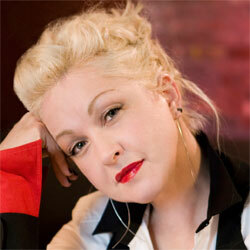 Cyndi Lauper (born Cynthia Ann Stephanie Lauper on 22 June 1953 in New York, New York), is an American singer-songwriter. Cyndi Lauper's music singles include, Girls Just Want To Have Fun, Time After Time, and True Colors. She also participated in the We Are the World single for USA for Africa in 1985, and won a Grammy the same year for Best New Artist. She starred in the MAC VivaGlam campaign in 2010 with Lady Gaga.